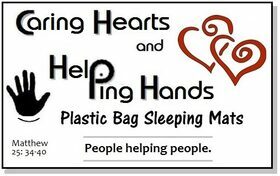 We make Plastic Bag Sleeping Mats by repurposing clean, used plastic bags to help the homeless. The mats are cushioned and serve as a moisture and temperature barrier from the ground. They are portable, durable, and a deterrent to bed bugs, and they can also prevent life-threatening bed sores. 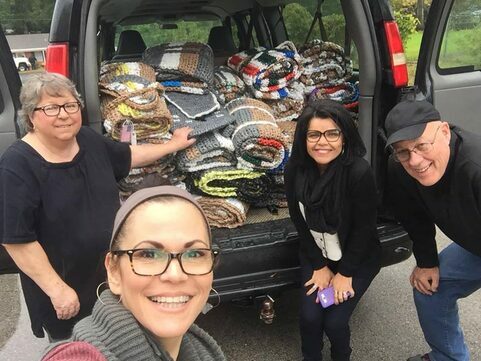 It takes a community to help the homeless. Please join us and help the homeless in our community. There is never a shortage of need, but a great shortage of caring hearts and helping hands. We need YOU! and even a little helps a LOT. All of our scheduled workshops are held in the Family Life Center of Southern Oaks Baptist Church (SOBC), across Amherst Dr. from the main SOBC building (unless specified otherwise). Please enter the building from the west parking lot nearest to N. Copeland Rd. To avoid the stairs, handicapped access is available at the north end of the parking lot and just around the NW corner of the building. You are invited to attend any and all of our FREE workshops. Crochet skills are not required, but training is provided during some of the workshops if you want to learn this skill. No childcare service is provided. Older children are welcome to participate with parental supervision. Generally, workshops are held based on the following schedule. Check actual dates to confirm. *​Friday and Saturdays are "come and go" or "come and stay the day". Bring a sack lunch if you plan on staying the full time. We encourage you to come and stay, get acquainted with the other volunteers. It's amazing to gather together for the same goal with like-hearted individuals. We need your helping hands. Use the "Send for more information" form below to request additional information. 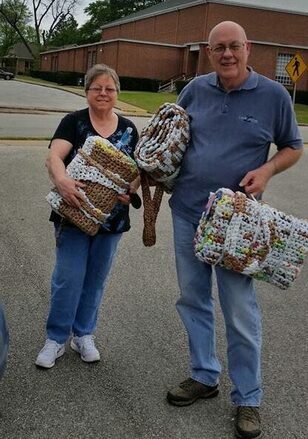 Caring Hearts & Helping Hands handing off our first sleeping mats to Jesus Closet for delivery to area homeless. 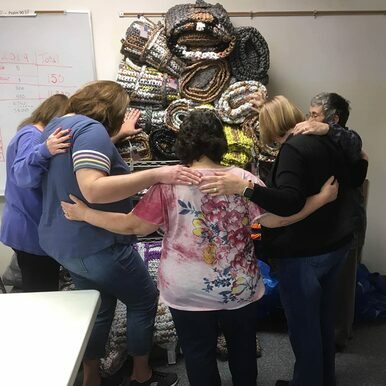 Before mats are sent out for delivery, the mats are prayed over by some of our volunteers. Mats are delivered to Jesus Closet, the Salvation Army, and Highway 80 Rescue Mission in Tyler. You don't have to be a member of any church to attend our free workshops. Phone or email your questions for more information.